How to Caculate Hydraulic Press Brake Bending Force? Hydraulic press brake bending capacity is max bending force can be applied for sheet bending. Normally when we select press brake, we shall use higher capacity than our max force needed. It will be good for machine life and future machine capacity attenuation with parts wear. 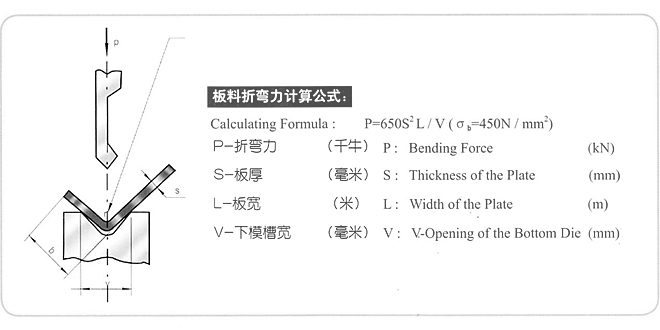 For example: mild steel yield strength is 450Mpa, we can us following formula to calculate. while for Stainless plate, the yield strength will be higher, hardness will be higher, spring back rate will be bigger. we can use same formula but time some rate. The force can be 1.5 times of mild steel plate. According to Plate thickness (S), Opening width of the bottom die (V), we can quickly find estimate bending force need for mild steel plate according to following table. Chart of press brake bending force estimation.